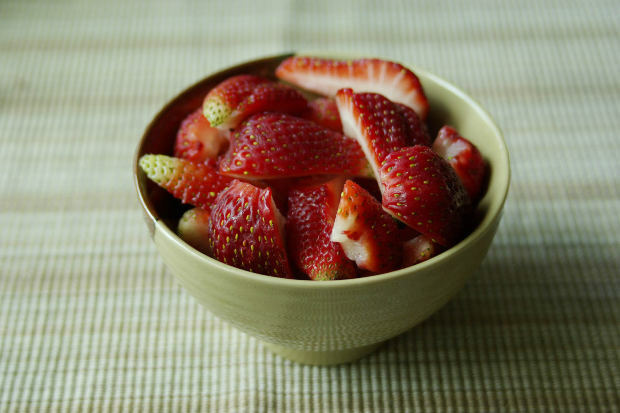 Turn a bowl of strawberries into a different bowl of strawberries. 3 pounds strawberries, hulled, peeled, quartered and (eventually) mashed. To prepare cake portion: Preheat oven to 400 degrees. Mix together ingredients, as kneaded. Set strawberry alarm clock for 15 minutes. Remove from heat. Let cool. To prepare filling: Do the same way your mother would. Pour filling over cake mixture, add cream-based topping, and more sugar, if you have it. Top with a cherry. Nutrition information: Unavailable at press time.